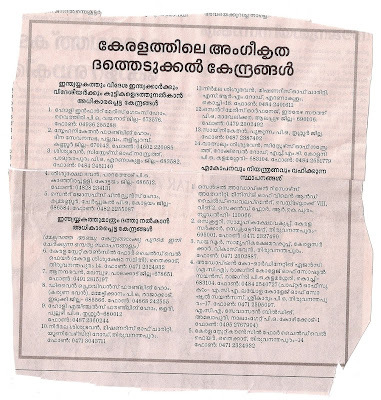 Here are the authorized child adoption centers in Kerala. If you want an English translation of it, please contact nriguru@gmail.com. നിയമപ്രകാരം കേരളത്തില്‍/നിന്ന് കുട്ടികളെ ദത്തെടുക്കുന്നതിനുള്ള അംഗീകൃ സ്ഥാപനങ്ങളുടെ ലിസ്റ്റ്. Click on the image to read properly. Dubai, U.A.E., 14th February 2010 – Mercator, the award-winning business technology provider, has completed its third project with Premier Inn in Dubai. Premier Inn Hotels LLC, an Emirates Group joint venture with Whitbread, officially opened its newest hotel, located opposite Emirates Terminal 3 at Dubai International Airport, last Thursday. Premier Inn now operates three hotels in Dubai, this latest one adding to the existing hotels at Dubai Investments Park and Silicon Oasis. Mercator used experience from projects it completed on the previous two Dubai Premier Inn properties as a foundation to create the deliverables for the latest hotel. The physical work involved in building the infrastructure remained the same, but the lessons learned previously were useful in accelerating the project and providing significant efficiency gains and cost reductions. To ensure hotel guests staying for business and leisure alike have access to the very best connectivity, the Mercator team was challenged with the design and installation of crucial IT infrastructure. This included the provision of both wired and wireless access points - no fewer than twenty wireless access points on each floor – to ensure Wi-Fi coverage throughout the hotel. This affords Premier Inn guests the convenience of reliable internet access and enables them to use laptops computers, not just in the 281 bedrooms, but wherever they are in the hotel. This service is provided to guests free of charge. Another essential element of the project was for Mercator to install Opera Property Management System – an electronic door locking system using KABA-SAFLOK door lock software. This allows the hotel staff to create and delete access keys on the system, smoothing the check-in process and allowing guests trouble-free entry into their room.